Find yourself in a virgin forest teeming with numerous forms of wildlife like monkeys, deer, wild pigs, and monitor lizards. Feast your eyes upon the fascinating varieties of flora and be enthralled by the sound of birds like parrots, tarictic, calao, doves, pigeons and jungle fowls. Add to these a refreshing, soothing climate and you have a good description of the wonders offered by QUEZON NATIONAL PARK. Just 180-km southeast of Manila in Altimonan, Quezon Province lies one of the most beautiful mountains in southern Luzon that has been declared a Game Refuge and Bird Sanctuary. The present area of the park is 984 hectares (4 sq. miles) with its highest point at 366-m above sea level. Accessibility is no major problem because a "first-class" national road passes through the park. Air-conditioned buses and cars may be chartered for the purpose or, if you want to rough it, there are public buses that ply the route regularly. The park can also be reached by railroad. Contact the Parks and Game Warden immediately upon arrival for information and assistance. The headquarters of the Park Officer in charge of administration is in Lucena, Quezon but there is always someone assigned within the vicinity of the park itself. The trek to the peak is more exhilirating than strenuous since there is a well-delineated and maintained trail. There are no marked dangers except during heavy rains when the path becomes extremely slippery. Under normal conditions, the hike to the peak can be done in two hours with adequate time to observe the lush vegetation and the magnificent creatures endemic to this area. Along the way to the top is a picnic and camping site. Trekkers, however, may find less frequented spots to suit their fancy by taking slight detours from the main route. For those interested in spelunking, there are several caves to explore. One or two have vertical shafts that can be descended by clambering down with a rope. But care must be taken regarding snakes and bats which have staked these out as their own territory. If the skies are clear when you reach the summit, you can get a panoramic view of the China Sea and the Pacific Ocean. Camp can already be set up near the ledge provided enough protection against the wind is taken. Otherwise, the evening can be spent at any other convenient spot a little farther back down. The hike may be undertaken anytime during the year in the absence of tropical storms or depressions or if advised otherwise by the local weather bureau. 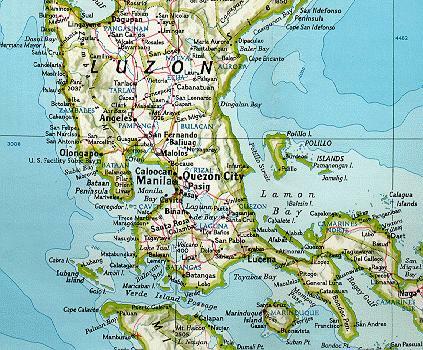 View this Map of Central Luzon. Ultralight backpacking software. - Offers software for lightweight camping enthusiasts who use ultralight backpacking techniques!